Introduction to the tribute and a reading of Diann’s writings. Read Diann’s Chicago Tribune Obituary here. “Here Comes the Sun: A Tribute to Diann DeWeese Smith” was written by Marilyn Campbell and Maya Friedler with introductions and closing credits by Cat Jarboe. The Feminist Lens is a production of Women’s Media Group, Inc. Maya Friedler, Executive Producer and recorded in cooperation with WFMT Fine Arts Radio, Chicago; Steve Robinson, Vice President; Peter Whorf, Program Director; Don Mueller, Production Manager. Produced by Maya Friedler; Hosted by Marilyn Campbell; Audio Production and Editing by Cat Jarboe; Directed by Al Nowakowski; Sound Engineering by Josh Sauvageau. “Here Comes the Sun: A Tribute to Diann DeWeese Smith” is brought to you in part by Wishbone Restaurant: Southern Cooking for thinking people. Breakfast, Lunch and Dinner, Wishbone serves fresh food at prices that leave room for more . 3300 N. Lincoln Ave. in Chicago. The Feminist Lens presents“Here Comes the Sun: A Tribute To Diann DeWeese Smith” Saturday, March 31 at 6:30-7pm (CDT) on WFMT. This very special show honors one of the most inspirational leaders in the feminist movement and a passionate fighter of inequity. Listen to excerpts from Diann’s memorial service recorded at The Women & Leadership Archives at Loyola University and candid interviews at the WFMT studios with author of the latest V.I. Warshawski novel “Break Down“, Sara Paretsky, Anne Ladky, Executive Director of Women Employed and Pamela Bozeman-Evans from the YWCA Metropolitan Chicago. The Fifth International SWAN Day- Support Women Artists Now Day is also March 31st and it will be celebrated throughout the months of March and April 2012. View the Program and Playlist here! Cheers to Nicole Hollander, Creator of the Fabulous Sylvia! Sylvia will always be with us when we need her for her clarity and wit. Keep in touch so that we can stay plugged into her vision. Love, Maya and the gang at The Feminist Lens! 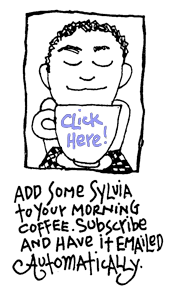 Comments Off on Cheers to Nicole Hollander, Creator of the Fabulous Sylvia!